The Age of Steel originally aired in 2006. Human race. For such an intelligent lot, you aren’t half susceptible. Give anyone a chance to take control and you submit. Sometimes I think you like it. I really don’t like Rise of the Cybermen. I think it’s a waste of a potential origin story for one of the Doctor’s most iconic adversaries. However, most of the problems with this two-parter are front-loaded. The set-up, quite frankly, is relatively pedestrian. It’s Doctor Who on auto-pilot. The follow-up, Age of Steel, actually works a bit better. That’s not to suggest that the script is any smarter or any tighter. Indeed, this is very much Doctor Who in big blockbuster mode. However, Age of Steel does have one massive advantage. It has director Graeme Harper working on it. Harper is, most notably, the only director to work on both the classic and revived Doctor Who. Harper did some quite frankly astonishing work on the original series, producing two genuinely classic episodes (The Caves of Androzani and Revelation of the Daleks) at a point when the series was in steep decline. As such, he earned his invitation to work on the more modern series. Harper has made quite an impression, directing four episodes of the second season, two episodes of the third and five of the fourth. That’s a fairly impressive list of accomplishments, and I think it’s fair to say that each of those was elevated by Harper’s direction. Harper’s work on the series – both old and new – is stunning, especially when he is given the right material to work with. The last ten minutes of Utopia, for example, rank among the very best stuff that the show has ever produced. The Caves of Androzani is on the short list of the best Doctor Who stories ever. However, you can really spot a great director by how they react to fairly middle-of-the-road material. And, to be blunt, The Age of Steel is very middle-of-the-road. It’s effectively a standard Doctor Who run-around with a conventional bad guy waiting at the end and some half-decent emotional beats included. Nothing about The Age of Steel seems like a classic. The script is probably best described as “functional”, hitting all the necessary notes and plot points, but lacking the wit or the follow-through to truly excel. So Harper is given a script that is basically a very shallow run-around, and he makes it work. I remarked above that The Age of Steel is a stronger episode than Rise of the Cybermen, and that’s because the script relies so heavily on Harper to deliver. He can’t turn this fairly conventional story into anything exceptional, but he at least manages to make it fun. Harper does an excellent job with the Cybermen. The redesign is great, but Harper also uses it remarkably well. He shoots the Cybermen from low angles to make them seem more imposing and threatening than ever before, and he manages to make the death of these metallic monsters at the climax of the episode mean something. You almost feel sorry for them as you see them screaming and clutching their heads in agony. It gives the handy and convenient technobabble solution a bit of weight that it wouldn’t otherwise have. Harper turns The Age of Steel into a reasonably successful blockbuster adventure. Harper’s direction helps gloss over the occasional plot contrivance needed to get this episode working. How does the Cyber Controller get to the roof so damn quickly at the climax? Why, if the Cybermen are converting millions of people ( we’re told that there are already “six thousand five hundred and rising” converted), why do they have Cybermen slumbering in Deep Cold 6? “Awaken the army,” a Cyberman commands, but you’d imagine they’d probably need every available Cyberman on the street. It’s to Harper’s credit that he keeps things moving so fast you don’t mind those sorts of logical questions. I wonder if this next-gen Davros attends Davos? Which is nice, because there are a couple of good ideas here, but not enough to sustain the episode on its own terms. A lot of them, obviously, carry over from the last episode. Once again, the villain is unchecked capitalism, as the Doctor himself can’t understand how a billionaire could have that much power. After the attack on the mansion, the Doctor protests, “But he’s overreached himself. He’s still just a businessman. He’s assassinated the President. All we need to do is get to the city and inform the authorities.” It turns out that this idea is hopelessly naive. Once again, Lumic feels too much like a cardboard villain. He’s a lamer version of Davros, but for the Cybermen, and somehow shallower than that particular wheelchair-bound megalomaniac. 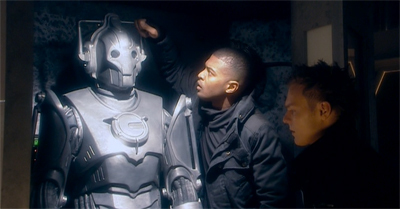 Although I do like that the Cybermen do pimp out his wheelchair when they make him Cyber Controller. I’d want a Cyberthrone, goddammit. Again, it really makes no sense for him to go so completely off the reservation so quickly. After all, this is a guy who simply wants to live a bit longer. You’d imagine that marching big metal men branded with his corporate logo into a takeover of the capital city would be low on his list of priorities. Hm. I’ve already seen this movie. Batman wins. Lumic’s defining characteristics are that he is a very rich man who wants to live forever. We know he’s still concerned about his wealth because he has copyrighted the formula used in the Cyberman procedure. If he was altruistic about converting the world, why would he do that? So, surely, it makes no sense for him to turn the population into Cybermen? Who is going to buy his stuff? Indeed, you’d imagine that Lumic would have a better job selling that “upgrade” to the public instead of upgrading the public by force. That is what was so unnerving about the Cybermen in The Tenth Planet – the notion that they had chosen to do that to themselves. It was something that was so very alien. Unlike a lot of later appearances, the Cybermen made relatively logical arguments for their world view. They were monsters because their perspective was so foreign and so incomprehensible to us. That was a great idea all those years ago, and it’s a shame that the series never revisited that concept. Instead, The Age of Steel reduces the Cybermen to a generic invasion force working at the whim of an insane wheelchair-bound megalomaniac. It looks like the decision to develop a catchphrase wasn’t the only aspect of the Cybermen inherited from the Daleks. 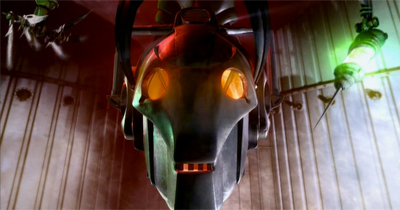 This weakens the episode and turns it into a much more conventional story of good and evil, removing a lot of the distinctive and unique aspects of the Cybermen. Of course, those aspects had been consciously played down over decades, but it feels like the new show doesn’t really know what to do with the Cybermen, just that it wants them back. 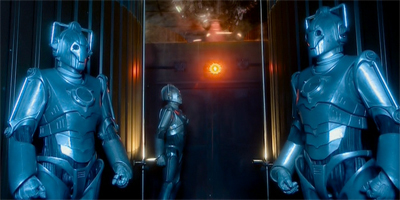 The Age of Steel does briefly brush with the idea that the Cybermen are the next logical evolution for this world. “But everything you’ve invented, you did to fight your sickness,” the Doctor explains. “And that’s brilliant. That is so human. But once you get rid of sickness and mortality, then what’s there to strive for, eh? The Cybermen won’t advance. You’ll just stop. You’ll stay like this forever.” That feels like a bit of a superficial argument. After all, these aren’t his Cybermen. And in Utopia, the Tenth Doctor praises humanity’s ability to stay in the same basic shape, so it’s not like he’s objective. This might be an opportunity to raise an interesting moral point – to suggest that the Cybermen are just inherently abhorrent to us as a concept precisely because they represent our genius and our ingenuity perverted. The Cybermen might be a form of evolution, but the are intrinsically and impossibly wrong. Of course, their attempts to impose their own evolution across the universe makes them villains, but there is something fundamentally terrifying about the thought that a human-like civilisation could do that to themselves. Who is the Doctor to decide that a particular life form is unfit to exist or that a particular avenue of evolution should be closed off just because we (and he) find it disturbing? It would actually be a pretty a nice mirror to Genesis of the Daleks, but a more nuanced one. The Cybermen are, after all, imagined as a vehicle for survival rather than a race of genocidal hate-fuelled monsters. That would be a very interesting point to raise, and The Age of Steel flirts with it briefly. Unfortunately, The Age of Steel undercuts this potentially interesting nuance. Even if the Doctor were to concede that the Cybermen have a right to exist, Lumic is still forcing people to convert en masse. When Lumic promises to take away pain, the Doctor responds, “It’s not yours to take.” This forced conversion immediately invalidates any potentially complicated moral argument and handily identifies the bad guy for the Doctor to deal with. 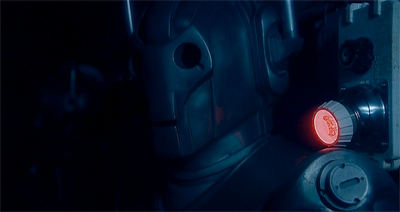 Outside of the Cybermen, The Age of Steel also closes out Mickey’s story. Indeed, he even gets to borrow one of the Doctor’s lines. “Hold on Rose,” he remarks as the building collapses, “I’m coming to get you.” It’s just a shame that Mickey has only really developed within this two-parter. And it’s more of a shame that this is really just a trial run for Doomsday. And it’s even more of a shame that Mickey’s fate would repeatedly be revised, returning to the regular world in Journey’s End. That makes this more of a detour than a character arc. There’s also the fact that the episode seems to effectively confirm that Mickey never really belonged in the TARDIS, and that he really was just a third wheel. I don’t mind a companion failing to work out (Adam, for example), but it seems a bit much to suggest that Mickey doesn’t fit in the TARDIS because he is effectively intruding on the super-awesome-fun team of Rose and the Doctor. “That’s the Doctor in the TARDIS with Rose Tyler,” he explains at the end, as if balance has somehow been restored by the fact that they’re no longer saddled with poor old Mickey. Wow. Mickey really was like a prototype Martha. No wonder the two paired up in The End of Time. 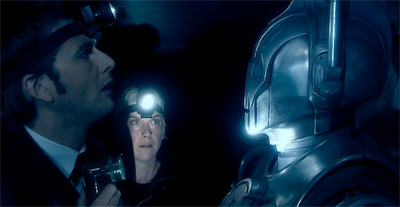 The episode also glosses over some interesting metaphysical questions raised by the fact that the Cybermen realise themselves on an alternate version of Earth. 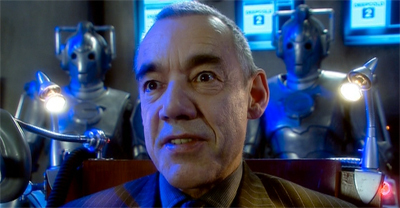 “There are Cybermen in our universe,” the Doctor states. “They started on an ordinary world just like this, then swarmed across the galaxy. This lot are a parallel version, and they’re starting from scratch right here on Earth.” It’s interesting that so similar a concept – right down to the name and basic design – should appear on a different planet in a different universe. Does that suggest that perhaps the Cybermen exist as some sort of primal force, an idea, a thought construct that simply impress themselves upon reality in a variety of ways? Of course, we know why the Cybermen develop on a parallel world (because Davies wants the show to be relatable), but it’s fun to wonder about such things. It’s nice high-concept to imagine, that the Cybermen aren’t so much a race as an idea that somehow seeps through time and space seeking to be given form. Still, The Age of Steel is far from a classic, but Graeme Harper is able to produce a reasonably exciting run-around that serves as a nice lead-in to the season finalé. It looks like we’ll have to wait for that definitive televised Cyberman origin story.